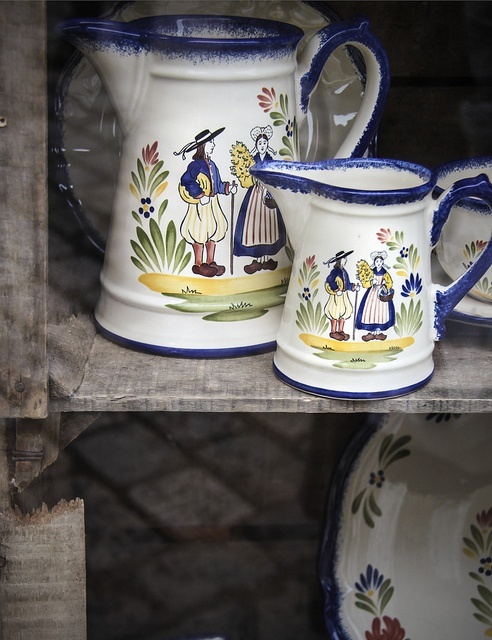 Like Limoges, a region in France, Quimper (pronounced “kem-pair”) doesn’t refer to simply one factory or maker producing faience (tin-glazed) wares. It’s actually a French town where this particular style of hand glazedpottery, sometimes referred to as Quimperware, was made by a number of different potters since its inception in 1690 by a certain Jean-Baptiste Bousquet, allegedly of its namesake. This colorful pottery is known for its hand decorated designs reflecting the culture of the Brittany region of France. In fact, it has the overall look and feel of folk art rather than finely crafted pottery. These pieces are often used in the French country style of decorating.